JACKSONVILLE, Fla. - They don't call them "pink tees" here at the Champions Club at Julington Creek. Nor do they even call them "ladies tees." They call them "forward tees," so as not to scar for life those male golfers who may want to creep up a bit closer to the hole. Don't call them "pink tees" at Champions Club. "They do that in Europe," said Champions Club's Assistant Professional Tony Gonzalez. Make no mistake, this isn't a European golf course. It is a traditional American course here on what they call Florida's First Coast, home of the NFL Jaguars and many a tourist's first stop on their way to sunny south Florida. The course is in the Julington Creek Plantation, a ritzy neighborhood just south of Jacksonville, in an area that has grown like wildfire the last decade. It's a residential golf course, which means there are plenty of homes along the perimeter, some a little too close for comfort. They must have blown half their budget on out-of-bounds stakes. Still, it's a pretty course, well-treed, with plenty of pine and oak, and there are even some holes (especially on the back nine) that offer what could almost be called a sense of isolation. Unlike many Florida courses, there isn't an overabundance of water, though there are enough small lakes and ponds to lose some golf balls if you're not careful and/or accurate. The course opened in 1988 with nine holes, but when ownership changed hands in 1991 it was expanded to its current 18. It's now owned by Jacksonville resident Steve Melnyk, the former Florida Gator and touring pro-turned commentator. It's about 6,900 yards from the back tees, and can be reasonably played from there with its slope rating of 132. There are some tough holes, though, like the 509-yard, par-5 eighth, which throws water at you on the right and trees on the left. With the hole curving back to the right, the landing area shrinks quickly - no place for a slice or a hook. The green slopes back to front toward water. This is a good, semi-private residential course that can be challenging from the back tees and even from the blue. It's 6,908 yards from the back, and the greens are in good shape and only moderately undulating. "I like that course," said Glenn Steiger, a frequent visitor to Jacksonville. "It doesn't have a lot of tricks to it or anything, and you can go pretty low if you can stay out of the woods." The course does have some thick woods on many holes, but most of the water is lateral. Women should enjoy the course, with its paucity of forced carries. There are too many homes on the front side, but much of the back is designated wetlands and thus largely development-proof. There are some nice waste areas on the course, but many of the holes play along busy streets. It's also not a good course for walking, with some fairly long rides between holes. 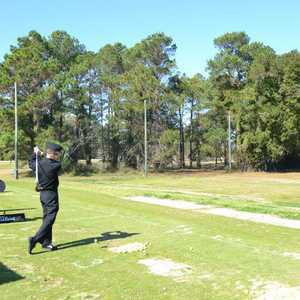 There is an excellent practice range and practice bunker. Green fees are in the $75 range. The Hilton Garden Inn is a good, centrally located place in Jacksonville, geographically the largest city in the country. The Hilton is right off Butler Boulevard, which will whisk you to the beaches or downtown. It has a business center; free, in-room, high-speed Internet; a whirlpool and a fitness center. The rooms have microwaves and small refrigerators. The Hilton's Great American Grill serves breakfast. Restaurants within walking distance include the Seven Bridges Brewery, Don Pablo's, Tony Roma's, Jacksonville Ale House, Jason's Deli, Copeland's and the Gallery Bistro. Champions Club has hosted the USGA Amateur, and this year it will be a qualifying course for the USGA Publinks Championship. 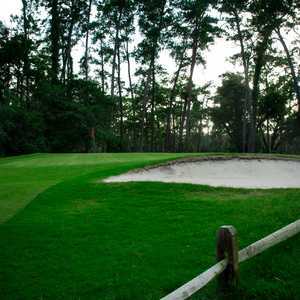 It is also a four-time host of the Hooter's Open.